I am really excited about today’s brilliant idea! I can’t think of the last time I hunted down a kitchen item the way I hunted these. 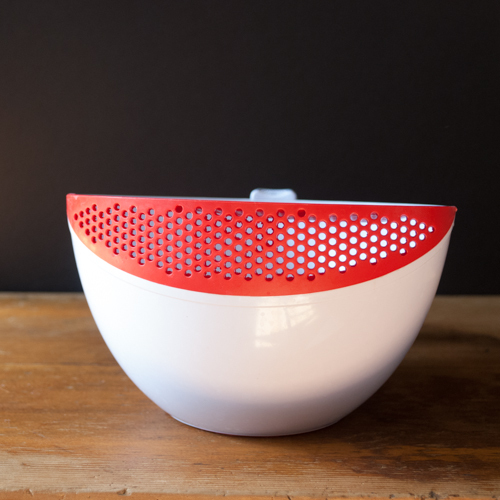 They are bowls with a silicone-like straining lip on the outer edge. 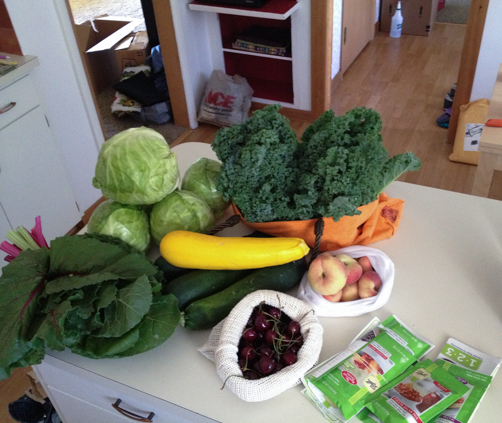 That’s right rinse your veggies or fruit in the bowl and tilt the bowl to pour out the water but not lose the fruit. 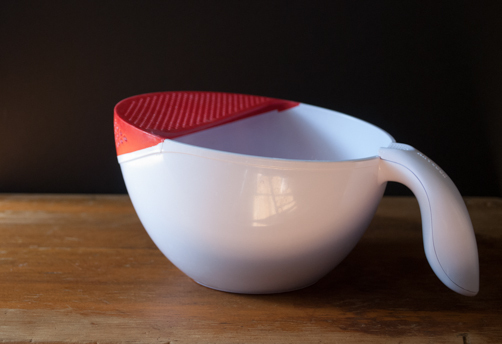 Hence, soak and strain bowls. 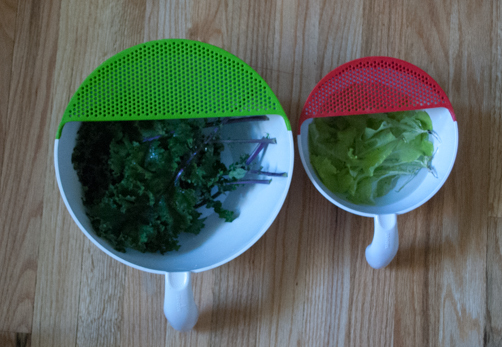 Before these I would rinse fruits and veggies in one of my metal bowls and because I wouldn’t want to dirty a 2nd dish (strainer) I would use my hands to try to hold all the berries, kale or whatever down while pouring the water out and would always lose a few of the good guys in the dump. I first heard about these in one of Dara Dubinet’s videos. I thought it was cool when I saw it in the video but really didn’t think to write down the name or anything. A few months passed by and I hadn’t favorited or noted which video of hers it was in so I went sleuthing on the internet and looking at google image search results. So many google image results until I found a black and white patent photo and worked my way back from there until I found the Art & Cook site. Yay! Treasure hunt over. Today if you do the same google image search hundreds of photos pop up. Glad the word is getting out! I ordered mine on Amazon because of Amazon Prime and bought the large in green and small in red. They are very light weight but thick and durable. 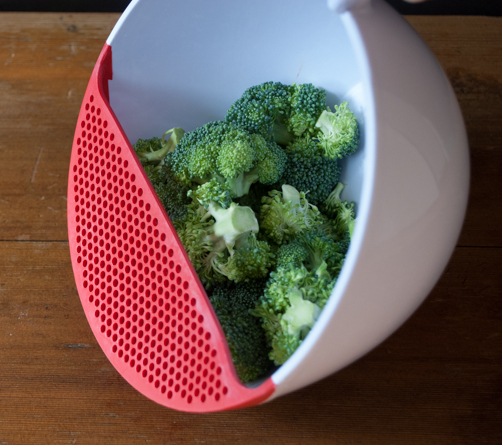 They are dishwasher safe (yes), can withstand high temperatures up to 220F, and have a nice large handle with a comfortable grip. Good job Art & Cook! Thank you for your innovation! 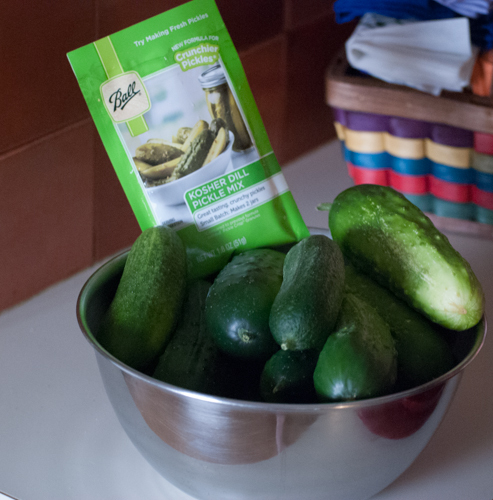 Now for some pickles! 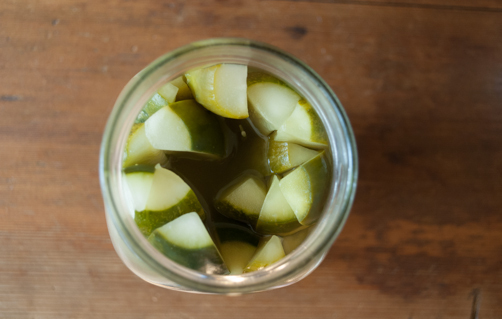 This marks the first summer for homemade pickles, well crisp homemade pickles. I technically have made them before in the crock but I didn’t have alum or grape leaves to help crispness so they were a little floppy. On one of our Saturday farmers market visits I noticed a couple of rubber banded packages of Ball canning mixes. I asked about them and the woman said that due to a grant they received the mixes were free! Before I could greedily grab two, she suggested I take a few because they had so many. Okay! I’ve since seen them at Ace Hardware, Winco, and Walmart near the other canning supplies. They’re really simple to make but you do have to muster up patience because they take 3 weeks to mature in the refrigerator. 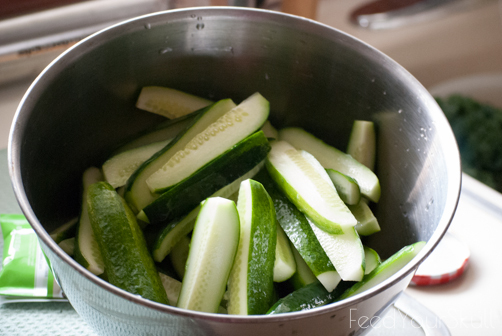 Start by washing and cutting the pickling cucumbers into spears. 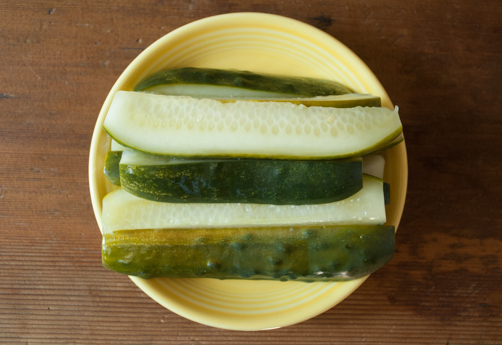 Pickling cucumbers are smaller and more ridged than typical grocery store cucumbers. They suggest placing them in a large bowl but I think it would work out best in a 13×9 cake pan. So spread them out in a 13×9 cake pan. Combine water, vinegar and contents of pouch in a medium sauce pan and bring to a boil. Then pour over spears and allow to cool until at room temperature, 30-45 minutes. Pack spears into jars and ladle pickling liquid over the spears. 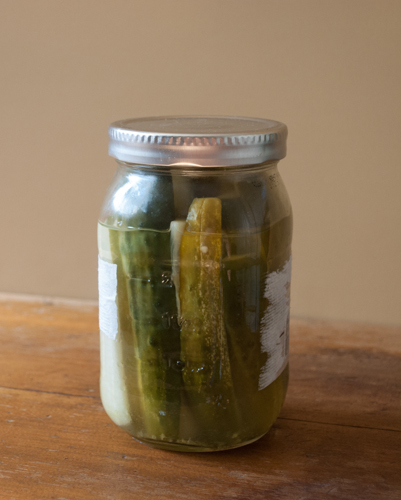 Place lids and bands on jars and refrigerate up to 3 weeks for best flavor. Will keep for approximately 3 months in the refrigerator. They are quite tasty and are not overly salty at all. They have a perfect crunch and we are devouring them as quick as our sauerkraut. 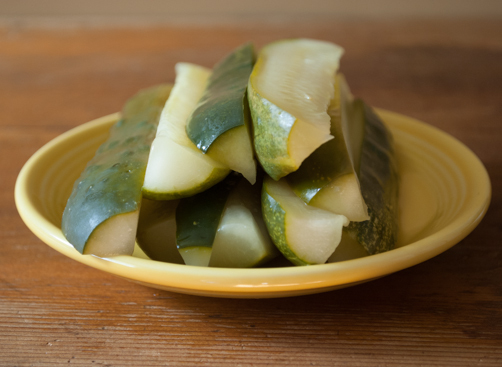 Now that I’ve made these pickles I can’t wait to try out my own mix! I think these would be delicious with a lot of garlic and fresh dill. Disclaimer: Hi! Just wanted to check in and let you know this is not a sponsored post. I have not been contacted to share or promote either of these items. It’s more like we’re standing in the break room and excitedly sharing what new thing we came across or learned about. If I have been asked to review a product, I will let you know that too! Thank you for reading.